Fred Yoder is an Ohio corn farmer who believes sustainability is more than a buzz word. 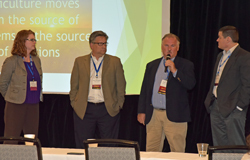 At the Corn Utilization and Technology Conference Yoder told AgWired about his involvement with Climate Smart Agriculture, a term coined to describe just what it is growers will have to do to feed 9 billion people while working with what we’ve got. Working with the climate, Yoder explains, means adapting to changes, taking the bad weather with the good and figuring out how to use that to make farmers more productive. It takes leaders, Yoder states, to make farming more sustainable. Someone needs to be out there being innovative on their ground. You don’t always make money at first, but then, very often, you do. And every farmer should be trying something, he believes.